The all-new iJoy Avenger 270 Kit offers the perfect balance between style and power, delivering a new and exciting kit that utilizes some of the most impressive vape technology ever released from iJoy to date. This powerful new setup provides an industry-first in regards to technological advancement, showcasing the Avenger Mod with iJoy’s first-ever Voice Control System which allows the user to alter nearly every setting of the device with sound of their voice. Originally crafted with futuristic design-elements in mind, the Avenger’s sleek chassis offers a beautiful two-tone finish and accentuated lines that emphasize its massive OLED color-display. Fueled by two 20700 batteries (not included), the powerful Avenger mod is capable of putting out 234W of unbridled vaping power and offers temperature control vaping between 200-600°F with Ni200 Nickel, Titanium, and Stainless Steel heating-elements. Constructed out of heavy-duty Zinc Alloy, the Avenger is a durable mod that measures 89.8mm tall x 50mm wide and will provide a flush-fit with any tank that measures 30mm in diameter. Putting forth a tried-and-true three-button construction, the Avenger mod utilizes a “hidden” side-firing bar that blends right into the side of the chassis. The convenient placement of the intuitive firing mechanism allows for comfortable holding and firing, no matter how you choose to hold the device. Personalization is king nowadays, and the iJoy Avenger 270 kit offers nearly endless customization to choose from. The Avenger’s front-facing +/- buttons offer an RGB backlight that can be personalized to meet whichever color scheme you prefer. Don’t want to navigate through the potentially-confusing menu system? Simply say “Turn on light” or “Romantic Light” to immediately change the color scheme of the Avenger to better suit the situation. Don’t know what the best wattage is for your coil? Say “Auto power” or “Auto watt” and watch as the Avenger mod changes the settings to meet your coils specific wattage output, all on its own. What’s more, the Avenger mod is equipped with a unique “custom user mode” which allows the user to fine-tune their vaping experience from second-to-second. The Avenger mod is equipped with an easily accessible Micro-USB port which can be used to quickly charge the device or upgrade the device firmware. Also included with this high-tech kit is iJoy’s flagship Avenger Sub-Ohm Tank. Constructed out of Stainless Steel and heat-resistant glass, the Avenger Sub-Ohm Tank features a convex glass section that significantly increases the tanks overall e-juice capacity. Measuring 51mm tall and 25mm wide, the Avenger tank is a beast of a tank that holds a massive 4.7mL vape juice capacity (3.2mL glass section available) for your all day vaping needs. Massive clouds will come easy thanks to its stylish wide-bore drip tip, and filling the Avenger tank couldn’t be any easier. With a few simple twists of the top cap, the top cap is removed to reveal two large top-filling fill ports. The base of the tank is equipped with a dual-adjustable airflow control ring that provides full-control over two large airflow channels. Whether you’re looking for the fullest flavor or just want to blow massive clouds, the Avenger Sub-Ohm Tank will not disappoint. Pre-installed inside the tank is iJoy’s flavor-driven 0.15 ohm X3 Mesh Kanthal coil. Unlike any of iJoy’s previously released coils, the X3 Mesh coil revolutionizes flavor by combining Wood Pulp and Cotton in one atomizer head. The result is a flavor-fueled vaping experience that must be experienced to truly understand. What’s more, the X3 Mesh coil utilizes a long-lasting Kanthal Mesh heating-element that covers a significant amount of wick surface area. This dramatic increase in coverage entails dense cloud production that only continues to get better from first vape till last. The iJoy Avenger 270 Kit offers an attractive, high-powered device that’s currently at the apex of iJoy’s innovation. 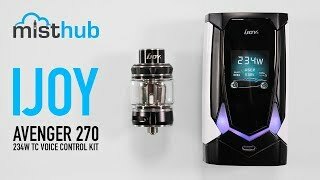 If you’re looking for a long-lasting, dual-20700 kit that brings the latest-and-greatest in atomizer technology, or just want to see what all the fuss is about with voice-activated vaping—the iJoy Avenger 270 Kit is the perfect setup for both beginning vapers and veterans alike.